3D technology reveals a whole new dimension in the lives of plants, from the most bizarre to the most beautiful. 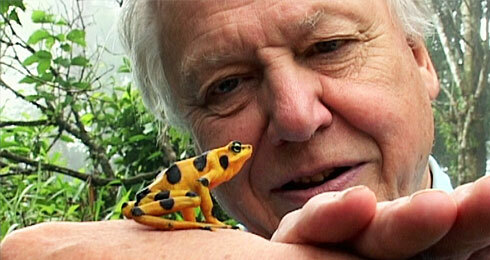 In this sensational documentary, shot over the course of a year, David Attenborough explores their fascinating world. Using 3D time-lapse and pioneering techniques in 3D macro photography, he traces them from their beginnings on land to their vital place in nature today, exposing new revelations along the way. He moves from our time scale to theirs, revealing the true nature of plants as creatures that are every bit as dynamic and aggressive as animals. 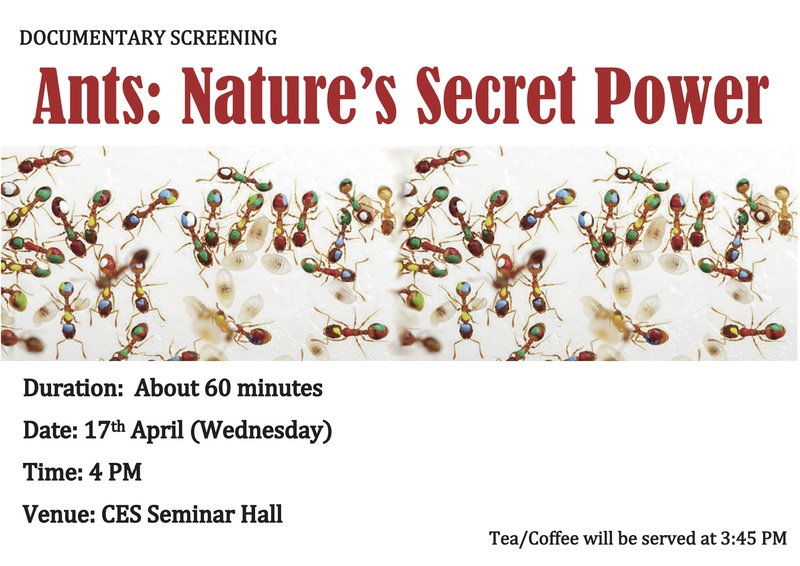 David discovers a microscopic world that’s invisible to the naked eye, where insects feed and breed, where flowers fluoresce and where plants communicate with each other and with animals using scent and colour. This spectacular adventure through the Kingdom of Plants is so immersive and compelling it has the capacity to amaze even the least green-fingered. 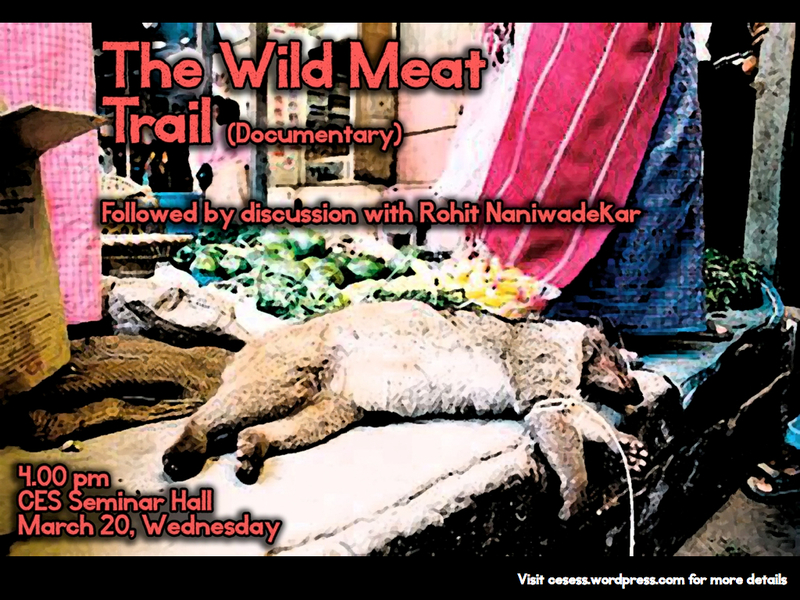 The documentary screening will be followed by a discussion led by Prof. Renee Borges, Chairman, CES. Origin of life is a documentary from the series First Life (BBC Documentaries). In more than fifty years of broadcasting, Sir David Attenborough has traveled the globe to document the living world in all its wonder. Now, in the landmark series First Life, he goes back in time in search of the very first animals. David Attenborough’s First Life is told with stunning photography, state of the art visual effects and the captivating charm of the world’s favourite naturalist. The epic story of the beginning of life on Earth from the much loved and respected naturalist, writer and broadcaster, Sir David Attenborough. Spanning billions of years, First Life reveals the extraordinary story of the evolution of the first life on Earth and how it then evolved into multicellular life, the first plant, the first animal, the first predator, the first to live on land: key moments in the development of the huge diversity of life that has lived on planet Earth. First Life travels the world, from Canada to Australia, Morocco to Scotland, to unearth the secrets hidden in prehistoric fossils and meet the palaeontologists who have harnessed new techniques to enhance greatly our understanding of the origins of life. 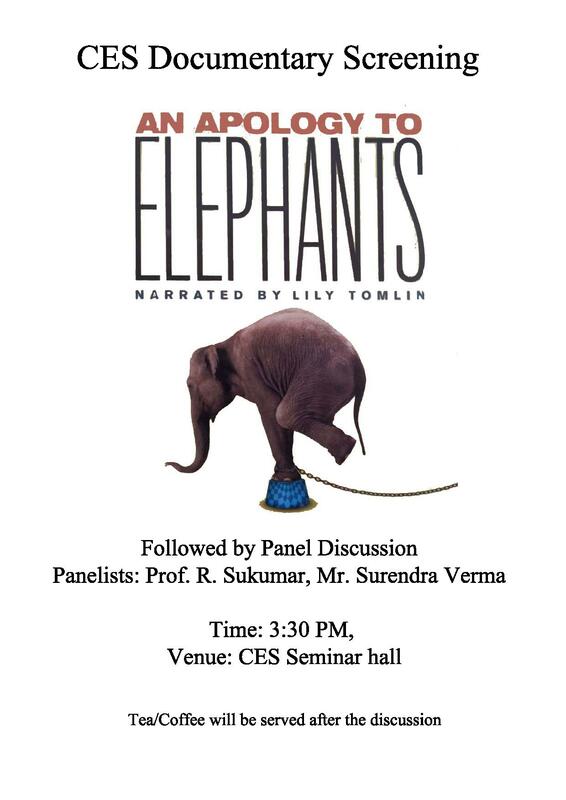 What – An Apology to Elephants, followed by a discussion with Prof. Sukumar, CES, IISc. and Mr. Surendra Verma, The Asian Nature Conservation Foundation (ANCF), Bangalore. 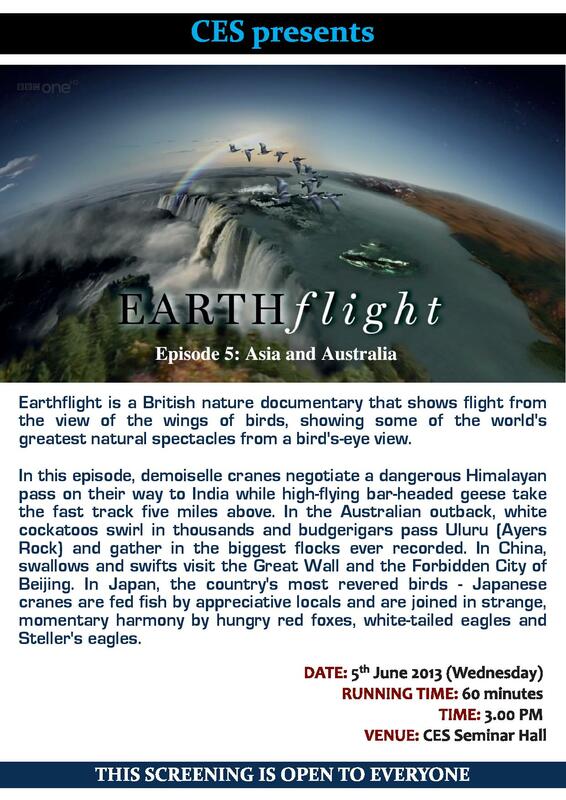 Earthflight is a British nature documentary that shows a flight from the view of the wings of birds, showing some of the world’s greatest natural spectacles from a bird’s-eye view. In this bird’s-eye view of two continents, demoiselle cranes negotiate a dangerous Himalayan pass on their way to India while high-flying bar-headed geese take the fast track five miles above. In Rajasthan, vultures watch hunting tigers hoping for a meal and pigeons visit a temple dedicated solely to sacred rats. Pigeons are also our guide to the greatest gatherings of camels on Earth and learn to dodge buzzards around the battlements of Jodhpur Fort. 9,000 cranes overwinter in the most unlikely of spots – a barbed wire compound in the centre of a desert town. In Australia, rainbow lorikeets drop in on Sydney and patrol Australia’s Gold Coast. In the outback, white cockatoos swirl in thousands and budgerigars pass Uluru (Ayers Rock) and gather in the biggest flocks ever recorded. In China, swallows and swifts visit the Great Wall and the Forbidden City of Beijing. In Japan, the country’s most revered birds – Japanese cranes are fed fish by appreciative locals and are joined in strange, momentary harmony by hungry red foxes, white-tailed eagles and Steller’s eagles. As peace descends, Japanese cranes dance beautifully in the snow. What animal has achieved immortality? What animal is the most warlike? What animal has the greatest supercity on the planet? Not man but ants. They are the real success story. It is only their tiny size and our vanity that allows us to hold onto the myth of our supremacy. Ants rule the planet. They are found in more habitats from far northern Finland to the sweltering tropics. The largest colony known of these insects is in Japan, where 306 million ants, with 1 million queens, in 45,000 colonies spread over 270 hectares. The fiercest warriors on earth are the slave maker ants. Other ants have barracks and sentry posts to protect themselves against surprise attack. Rohit, a PhD student at Nature Conservation Foundation, has been working in Arunachal Pradesh, Northeast India since 2006. A part of his research has focused on understanding impacts of hunting on hornbills and ecosystem processes like seed dispersal.